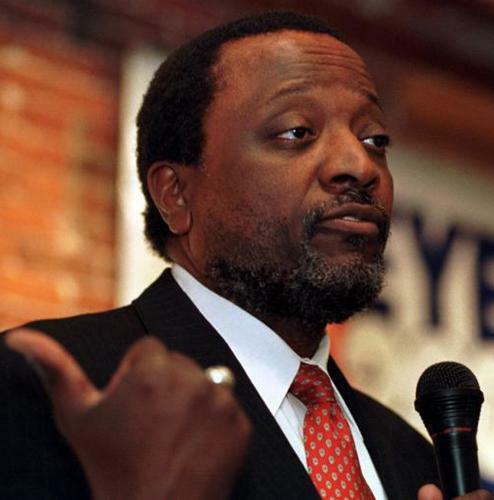 Through his great work and his writings, Alan Keyes has unknowingly contributed to both of the campaigns of Brian Kelly. The Kelly platform has much basis in the writings of Alan Keyes as Brian Kelly has always been highly impressed with and is influenced by the Ambassador's work. Kelly sees Keyes as one of America's potentially greatest heroes and one of the best orators, ever. As a compliment to Barack Obama, Kelly would trade ten Obama Cards for one Keyes card, if he could. Keyes is that special. All of us have a number of heroes. Brian Kelly's political hero is Alan Keyes, who happens to have been a Republican most, if not all, of his political life. Alan Keyes is a good man, so he is also a hero simply on the human-being front. For decades, he’s been the champion of the unalienable right to life of the innocent unborn and a tireless campaigner against the purveyors of the culture of death. Keyes made a run for the State Senate against Barack Obama. He lost because he told the truth. He was also a candidate of the American Independent Party in the 2008 Presidential election, but he was not given air time by the media in any of the debates. Alan Keyes is as good as it gets and America would do well with Alan Keyes at the helm. Keyes, in most ways, thinks as Kelly does about America. For example, in addition to his opinion on the right to life, he is an advocate of border security, low taxes, the right to keep and bear arms, property rights, religious liberty, protecting free political speech and an open political process. Additionally, Keyes is for preserving the institution of the family and marriage. You can count on Brian Kelly's conservative values to be an advocate in the US Senate for these views because Alan keyes is that special. Alan Keyes has done much work in characterizing his own views on the issues of the day. Because he has done that and because Kelly is in the 95% or greater acceptance percentile on Keyes' doctrine, you can expect better days to come if you choose to elect Brian Kelly for your US Senator. More importantly than voting Kelly in, you owe it to your children and grandchildren to vote Robert P. Casey, Jr. out. He is not a true Pnnsylvanian. If you ever take the opportunity to listen to Alan Keyes, you will know why Brian Kelly has raised him above all others engaged in the political process. Kelly would like to think that Keyes thinks like him, but Kelly jokes that "the best I can do with the truth here is that in most ways, we do think alike." Both Alan Keyes and Brian Kelly would direct you way back to the foundational Declaration of Independence principles which, if they are abandoned, will make the survival of liberty in America impossible. This is where America gets its strength -- from the blood of our founders in their fight for our freedom, several hundred years earlier. As Brian was posturing his candidacy as the PA-11 Representative to the Congress of the United States, in 2010, he researched Keyes even further and would like to use the following reference from Keyes site for this unveiling of his Senatorial platform. It is very similar to that of Alan Keyes, but not identical. Keyes is a great intellectual and pure thinker of our times, and so Kelly wants to make sure that Ambassador Keyes gets due credit for many of the notions that are included in Brian Kelly's congressional platform. Brian Kelly is a complete fiscal and social conservative and yes, he is a Democrat. He believes that the Democratic Party has left most Democrats behind in its adoption of the California hard-left Marxist / progressive principles. See how well these principles have served California. There is no reason to export California principles to the rest of the nation even though it would make Ms. Pelosi very happy. Start the 2013 election cycle right, contribute a small amount, no more than $100.00 to the KellyforUSSenate campaign, but more importantly, tell youself, no more Casey. If the Irish are forced to rule, let it be Kelly and not Casey. God bless you all, God bless Pennsylvania, and God bless America!